Use this powerful feng shui Life Force Amulet Keychain amulet to welcome in vitality, success, and good fortune chi into your life ! The mantras inscribed on the keychain strengthen life force and the seed syllables in the center and petals of the amulet strengthen positive auras and prosperity. The red Windhorse brings strength and determination for successful endeavors and goal-fulfilling. The Life Force Amulet itself is approx. 1.875" x 2". The dimension of the horse amulet itself is approx. 1.5" x 1.5". 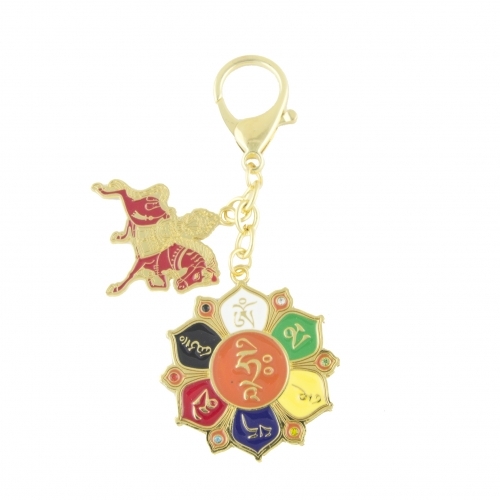 The overall length of the Feng Shui Life Force Amulet Keychain is approx. 4.5". It is made of metal.